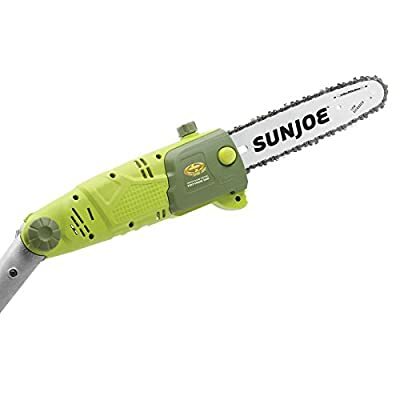 Take care of hard-to-reach branches with ease thanks to the Sun Joe SWJ803E Multi-Position Electric Pole Chain Saw. 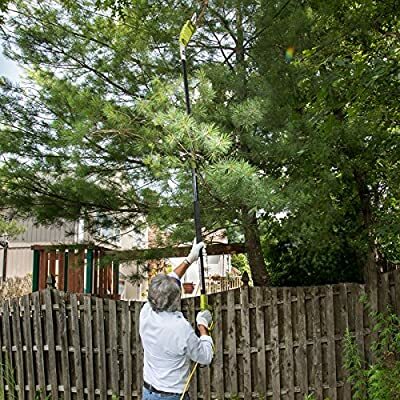 This chainsaw comes with a telescoping pole to extend your reach up to 15 feet and features an multi-angle head that adjusts up to 30-degrees. The 10-in. Oregon cutting bar has a self-lubricating design that never needs maintaining. The electric motor is quiet and powerful, free of offensive odors and smoke. A built-in safety switch helps prevent accidents. 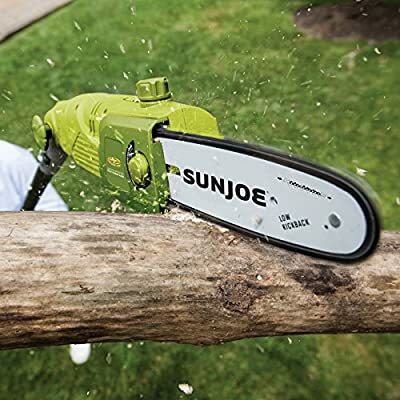 Snow Joe has a robust research and development team that works hard to bring you creative, pleasing designs combined with technological advances to provide you with high-quality outdoor products. 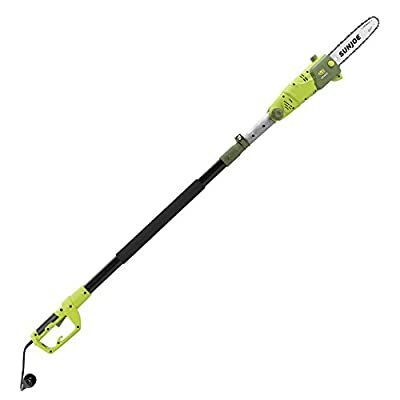 Originally started to bring you outdoor power equipment designed for winter, Snow Joe now distributes a wide range of easy-to-operate, reliable, and powerful equipment to take care of everything from snow removal to trimming your hedges. 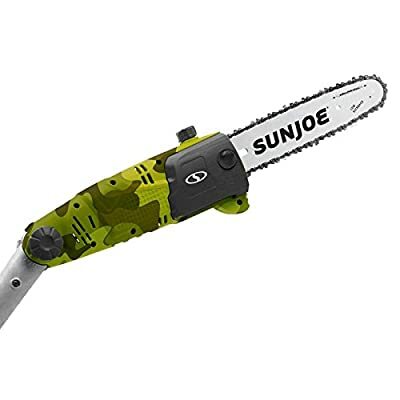 Designed for everyone, from the garden enthusiast to the average "Joe", Snow Joe has the perfect outdoor solution for you. Based in Edison, N.J., Snow Joe distributes its products throughout the United States and Canada. Snow Joe is constantly developing new products for each season, and has expanded their line to include indoor solutions with holiday storage, humidification, and insulation products. Dimensions: 96.45L x 5.5W x 3.6H in.. Select from available color options. Features 10-in. oregon cutting bar and chain. Up to 7.9 lbs. in weight and includes automatic lubrication. 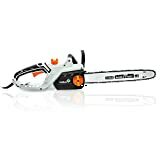 Includes 8-amp motor and cuts branches up to 9.5-in. thick. Features (0 to 30 degrees) adjustable multi-angled head. 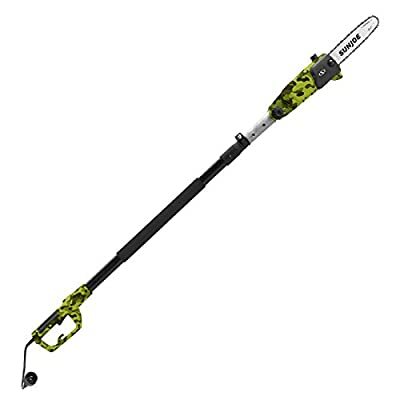 Provides up to 15-ft. overhead reach with telescoping pole extending 9.4 ft.. 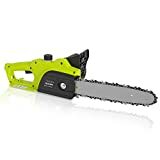 Suitable for cutting thin logs and overhanging limbs. CSA approved.